Starting a PhD program is, professionally and personally, one of the most exciting times of life. You’re meeting people who will be your peers and advisors in the coming years whose research interest align with yours, getting acclimated to a new university and city, and of course starting a fresh school year. However, many first-year PhD students, as they’re going to happy hours to get to know their cohorts and buying their textbooks, are thinking to themselves: “Am I going to make it until my first paycheck arrives?” Financially speaking, starting a PhD program is one of the most challenging times of life as well. The financial challenges of the transition into a PhD program are myriad and the resources are likely to be few. Moving to a new place and starting the school year are expensive endeavors, and sub-optimal decisions around housing and transportation may reverberate in your finances for years to come. I present this article not to discourage you in what should be an invigorating and hopeful experience, but so that you have time to prepare for its unique financial demands. 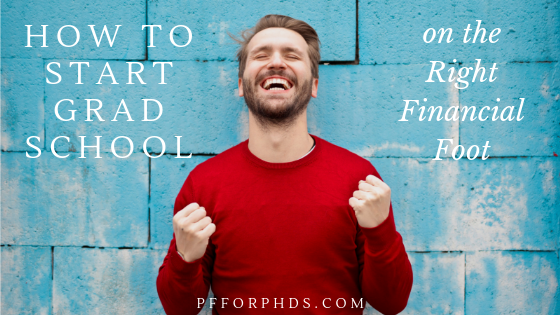 Starting grad school on the right financial foot means that you are poised for financial success throughout your PhD instead of reeling from the initial financial blow and playing catch-up for months and years to come. Here is what you can do in the months leading up to your transition into grad school to start in a place of financial strength. It’s vital to put your stipend offer in context as early as possible. The number may strike you as generous-for-a-stipend or meager, but until you know something about the local cost of living it is rather meaningless. The best way to get an idea of how far your stipend will go is to start drafting a budget and use approximate numbers until you lock in various aspects of your living expenses. Two starting points are the Living Wage Calculator and the estimated room and board from your university’s financial aid office. Neither one of these numbers will prove to be totally accurate (I hope they are both overestimates of what you will pay) but it’s a start for the triangulation. Your necessary expenses, i.e., housing, transportation, utilities, groceries, household consumables, clothing, etc. Your education expenses, i.e., tuition and fees required to be paid out of pocket, course supplies, etc. To a degree, you can use your current expenses (if you track them) to estimate what your future expenses will be, possibly with an adjustment for the shift in the cost of living. It’s quite difficult to drill down into the specifics of what you will spend in a job/life that you’re not yet in, especially if you are not currently tracking your expenses. Therefore, you can use placeholder percentages to help you estimate your expenses and guide your decisions. For example, the Balanced Money Formula states that you should not spend more than 50% of your net (after tax) income on all of your necessities together (including minimum debt payments). This is a challenging benchmark for grad students to adhere to, especially in high cost of living areas, but it illustrates how important it is to keep your necessary expenses in check to the greatest degree possible. Housing is by far the largest expense in virtually every grad student’s budget, and first-year PhD students are expected to make this enormous financial decision with little to no insight into the local area. The result is that graduate students often overextend themselves in their housing costs, which are financially, logistically, and emotionally difficult to change. Starting grad school on the right financial foot means locking in your fixed housing and transportation costs at a reasonable level for your stipend. The general rule of thumb is to spend no more than 25-30% of your net (after tax) income on housing. This guideline proves impossible for many if not most PhD students, who may be paid too little, live in an expensive area, or both. Further reading: How Much of Your Stipend Should You Spend on Rent? Particularly in those challenging housing markets, the best course of action to find the most suitable housing (even if you spend more than the guidelines) is to start your search early and thoroughly research your options. I recommend starting your research with a housing survey conducted by your university or graduate student association (if one exists) and senior grad students who are paid a similar stipend to what you will be (e.g., 3rd years and up). From these sources you can ascertain the price range you can expect for housing and potentially tips on the best locations, housing types, and even specific complexes or landlords to pursue. A note on on-campus or university-affiliated housing: On-campus housing is attractive for students moving from a distance because it short-circuits this whole decision-making process. But this type of housing was not all created equal. At some universities, the university housing is subsidized, which means there is likely fierce competition to live in it. At other universities, the university housing is more expensive than comparable non-affiliated housing. You won’t know whether university housing is a good deal and worth pursuing until you talk with current grad students. Should I Buy a Home During Grad School? Alongside figuring out your housing options and eventually committing to something, you need to decide how you will get around town. If you don’t own a car, you might need to buy one. If you already own a car, you have to decide whether to bring it with you or sell it. Owning a car, even without a car loan, is a very expensive undertaking. Beyond the cost of the car itself, you typically have to pay for insurance, parking, gas, registration fees, inspection fees, taxes, maintenance, and repairs. If it is feasible to live car-free in your new city and you don’t currently own a car, I recommend trying to live car-free for your first year. You can always reassess and buy a car at a later time if you decide you want one. If you decide to buy a car or keep the car you already own, make sure you globally assess your expected costs (not just the best-case scenario!) and write them into your budget. An expensive or newer car costs you more not just in the purchase price but in your insurance premiums as well. Your transportation and housing expenses are necessary to fix in concert to a degree. If you decide to live car-free, you might choose to pay more to live closer to campus or on a convenient bus route. If you decide to buy or keep a car, you can offset some of those costs by finding less expensive and less convenient housing. Most graduate students experience what I call the long and expensive first month of grad school, though I have noticed some universities are working to change this pattern. You must prepare for this long and expensive first month prior to starting your transition to grad school. The expense of the first month comes from your move. First, the moving expenses themselves: your and your possessions’ transportation to your new city plus the cost of feeding yourself and so forth during that time. Second, the start-up expenses for your new place: first (and last) month’s rent and security deposit, deposits for your utilities, furniture, and stocking your pantry. Third, the expenses of a new school year/term: any money that you must pay to your university in a lump sum and the expenses associated with your coursework. The long first month refers to the length of time from when you move to your new city until you receive your first paycheck. Personally, I showed up for orientation in mid-August and didn’t receive my first paycheck until the last day of September. Of course, that time includes all your regular living expenses, on the back of your moving expenses. You want to be sure going into the long first month that you can come out the other side without racking up debt. Saving cash in advance to pay for the transition is the best solution, and a transition budget will help you estimate the total cost. Because you have several months between now and your matriculation into your PhD program, you have the opportunity to establish your financial foundation prior to the challenges of this transition. By financial foundation I am referring to saving cash for the transition, saving an emergency fund, paying off debt, and/or investing – whatever is most appropriate for you right now. If you currently have a full-time job, you have the most opportunity to shore up this foundation, but even as a student or part-time/gig economy worker, it is still possible to a degree. It will be well worth a few months of sacrifice, either in terms of earning more through a side hustle or spending less through frugality, to start grad school on the right financial foot instead of a few steps behind. After you save the money you need for your transition into grad school, consider whether you can pay off any of your current consumer debt completely (e.g., credit cards, car loan, medical debt, IRS debt). While you can defer student loans while you are in grad school, these other kinds of debts will still require minimum payments even while you receive your stipend, so it’s worthwhile to attempt to knock them out completely. If you spend the time and effort now on planning out your expenses and saving money, once you matriculate you will be able to focus solely on the stimulating new people and experiences you encounter instead of experiencing financial stress. Starting grad school on the right financial foot by locking in a good deal on housing and not allowing yourself to fall into credit card debt also sets you up for financial success throughout your PhD. An ounce of prevention is worth a pound of cure. If you would like to me to work with you on navigating your financial transition to graduate school, please check out my financial coaching program exclusively for rising grad students.